Two STS Enterprise team members were honored on the 2019 Memphis Flyer “20<30” list. Each year, since 2009, the publication has released the list that spotlights young people shaping the future of Memphis. This year’s list included Alton Cryer, co-founder of STS Enterprise, and business development officer at Orion. Also included was Rachel Anderson, STS Enterprise executive team member, and instructional designer at St. Jude Children's Research Hospital, ALSAC. Next, three STS Enterprise team members were named as finalists for Memphis Business Journal’s “Best of the Bar” awards. For three years, the publication has recognized the top legal minds in the Memphis and Mid-South in the areas of private firm attorneys, public service attorneys, in-house counselors, associates, and for lifetime achievement. Awards will be presented on March 5, at Memphis Botanic Garden. The finalists included: Corbin Carpenter, STS Enterprise Board of Directors Chairman, and managing member at Carpenter Law PLLC; Brittany Williams, STS Strive Assistant Director, and attorney at University of Memphis Cecil C. Humphreys School of Law and City of Memphis; and JB Smiley Jr., STS Strive Coach, and attorney at Smiley & Associates. To support the work of STS Enterprise, donate via our PayPal. “If you look good, you feel good. If you feel good, you play good. If you play good, they pay good.” A quote from Deion Sanders read by the Meghan Heimke, executive director of the Memphis Suit Project, as she explained the purpose of the effort. For the past three years, STS Enterprise has assisted in bringing this quote to life through a partnership with the initiative. It is a 6-week program where its recipients, normally high school and college students, gain a new tailored suit to add to their wardrobe. The recipients gain lessons on confidence and credibility, learn the importance of first impressions, receive soft skills training, attend private workshops, and make beneficial connections. This program is designed to help those who are striving to improve their lives by gaining employment and furthering their education. There were 19 members of STS Strive awarded a new suit from New York Suit Exchange. STS Strive members completed the program and on December 8, 2018 with a celebration. In a room filled with cheering loved ones and supporters, these deserving recipients took to the runway to present themselves and show off their new confidence. They expressed the effectiveness of the program and explained what being in the program had done for them. There was confidence in the way they walked and talked. Their smiles were bright, they were speaking clearly, making eye contact, the transformation was obvious. During one recipient’s testimonial, he stated that seeing how good he looked in a suit changed his views on wearing one. The celebration displayed the purpose of the program and why it is important to be confident and mindful in personal presentation. STS Enterprise looks forward continued partnership with Memphis Suit Project with hopes to continue to increase the number of recipients within the program. Help STS Enterprise continue “Making Excellence The Norm” through programs like this by donating to our PayPal here. STS students model their new suits from New York Suit Exchange. On December 10, 2018, STS Enterprise was celebrated by The SPARK Awards. The SPARK Awards are the Mid-South's annual televised award show that honors individuals and organizations making a difference in the community. 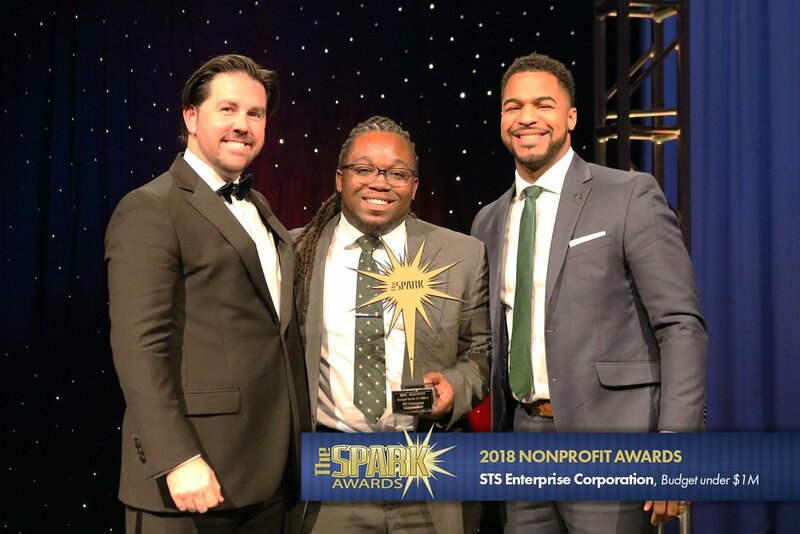 At the fifth annual show, STS Enterprise was honored with the 2018 SPARK Award for Nonprofit with Budget Under $1 Million. “We don’t do our work to be praised. We do our work to make an impact on future generations of Memphians. But, I must say cityCURRENT and WKNO-TV have truly shown us generosity with how they have celebrated our programs and showcased our work to their audiences. This award has definitely elevated us to a new platform and we are very grateful for it!” said Alton Cryer, co-founder of STS Enterprise. The SPARK Awards celebrates and recognizes the efforts of individuals, nonprofits, corporations, and schools, in 13 different categories, who are igniting change and making a positive impact in the Greater Memphis community. “This year has really been one of stepping out of the limelight for me and Alton. Honors like the SPARK Awards truly help us to showcase the dedication of our more than 80 volunteers along with the incredible accomplishments of our students. I am so grateful to cityCURRENT and WKNO-TV!” commented Jeremy Calhoun, co-founder of STS Enterprise. The awards are an extension of the WKNO-TV series, “The SPARK.” The SPARK is a monthly 30-minute show about business and community leaders who are fueling change and giving back to the Mid-South. Major funding for The SPARK Awards is provided by Lipscomb & Pitts Insurance, Data Facts, and Champion Awards & Apparel. Additional funding is provided by Christian Brothers University, SRVS, My Town Movers/My Town Roofing/My Town Miracles, United Way of the Mid-South and Mueller Industries. Help STS Enterprise continue “Making Excellence The Norm” by donating to our PayPal here. As a volunteer-run nonprofit, STS Enterprise Corporation understands that people are at the heart of any great mission. That is why the youth leadership development organization is always excited to bring new leaders, mentors and partners to the table. In 2019, STS Enterprise will welcome five new partners. These new partners include: Shelby County Schools’ Hamilton High School; OWLS LLC; City of Memphis MPLOY; Soulsville Charter School; and the University of Memphis’ Student Success Program. In connection with Communities In Schools (CIS), Hamilton High School will collaborate with the STS Strive program to allow its high school students to participate in monthly sessions held at the school. Furthermore, CIS will promote the STS Strive program through direct and digital marketing efforts. OWLS LLC will work with the STS Strive and STS Elite programs. OWLS provides professional development and curriculum writing services to school districts, corporations, and nonprofits. As consultants, the company specializes in creating content that helps leaders improve the way their organizations learn, interact, and perform. STS Enterprise will have access to OWLS’ proprietary content for the purpose of perfecting curriculum development and becoming a premier alternative for leadership development. "This partnership will be an effort to help solidify both STS and OWLS as agents of change in the city of Memphis,” said Dominic Lawson, co-founder and COO of OWLS. “We will help STS in crystallizing its vision of being the premier leadership organization for youth by advising on best practices in engaging youth and scaling the organization. STS in return will help us deepen our relationship with emerging youth leaders and corporate partners in the city of Memphis." MPLOY will help the STS Strive and STS Elite programs offer real-world experiences to students so that they can execute the skills they gain. A locally-funded initiative, MPLOY provides City of Memphis youth, ages 14 to 22 years old, with meaningful and rewarding 6-week summer experiences. Various career path options according to the participants’ strengths and interests, including soft skills training, entry-level positions, and internships. MPLOY has committed to guaranteeing all STS students gain a 2019 summer internship. The STS Speaks effort will gain traction in 2019 thanks to the partnership with Soulsville Charter School. STS Speaks is an honorarium based-program of STS Enterprise where its coaches, leaders and professional partners take on public speaking engagement opportunities with the goal of empowering youth and college students through stories, workshops, and lectures. In 2019, STS Speaks will offer its pool of speakers for the charter school’s annual young men’s conference. STS Speaks will also establish a pipeline of speakers with the charter school’s alumni. Finally, the University of Memphis’ Student Success Programs will also become of partner for the STS Speaks program. The university has committed to securing paid engagements for the program in 2019. STS Enterprise Corporation is an organization of inclusion and unity so much so that the members of the STS Strive program and two of the program’s parents, Shuntea Price and Mary Bibbs, started a parent booster club to give the parents a voice and assist them in their desire to support the organization's efforts. The parent booster club is where the parents are able to advocate for the program, recruit parents and student, provide parental advice, and build relationships in the process. They have created fundraisers such as a Krispy Kreme voucher sale, proposed a spring car wash, and a raffling, explaining why one of the benefits of STS Strive is parent engagement. Going beyond just dropping their child(ren) off for program activities, the parents are also coordinating events and being active participants in different decision-making aspects of the program. They too strive to help empower their children to become leaders and obtain post-secondary opportunities. The parents involved in the parent booster club believe in the mission of the organization and they are committed to aiding STS in continuing to be the preferred leadership organization in the mid-south. For more information about STS Enterprise be sure to follow STS on all social media platforms and subscribe to the newsletter from the organization’s website by clicking the link provided www.stsenterprise.org. Setting The Standard. That is what the “STS” in STS Enterprise Corporation means. year. The board includes Memphis leaders from various disciplines and walks of life. In 2012, Jeremy Calhoun and Alton Cryer acted on their passions for youth and the Greater Memphis community by introducing STS Enterprise Corporation. A 501 (c)(3) nonprofit, the organization is dedicated to developing and empowering the next generation of Mid-South leaders. Through Authentic, Transformative and Excellence-Driven programs, the nonprofit is encouraging students to exceed expectations, defy stereotypes, and create an unyielding mindset. Learn more about how STS Enterprise is “Making Excellence The Norm” at www.stsenterprise.org. STS Enterprise is teaming up with education consulting firm OWLS LLC. OWLS provides professional development and curriculum writing services to school districts, corporations, and nonprofits. They specialize in creating content that helps leaders improve the way their organizations learn, interact, and perform. This gives STS the opportunity to have access to OWLS proprietary content for the purpose of perfecting curriculum development and facilitation aiding STS in becoming the premier alternative for leadership development. "This partnership will be an effort to help solidify both STS and OWLS as agents of change in the city of Memphis according to co-founder and COO of the OWLS, Dominic Lawson. We will help STS in crystallizing its vision of being the premier leadership organization for youth by advising on best practices in engaging youth and scaling the organization. STS in return will help us deepen our relationship with emerging youth leaders and corporate partners in the city of Memphis." Dominic who currently serves as a coach/facilitator for the STS Strive program, a facilitator for the STS Elite college program, and on the STS curriculum development committee with his wife already has an in-depth understanding of STS and its programs. STS Enterprise President Jeremy Calhoun served as a panelist for the University of Memphis’ Emerging Leaders program on Tuesday, September 25th. The Emerging Leaders Program, a comprehensive scholarship program, began in 1983 and has been of benefit to over 700 students since its inception. The session focused on Professional Preparation: Landing and Succeeding in your First Job. Calhoun was pleased to “give them some practical advice to get them where they need to go.” He spoke on the importance of following-up and developing competencies/skills to make you more valuable regardless of your major or discipline. In 2012, Jeremy Calhoun and Alton Cryer acted on their passions for youth and the Greater Memphis community by introducing STS Enterprise Corporation. A 501 (c)(3) nonprofit, the organization is dedicated to developing and empowering the next generation of Mid-South leaders. Through Authentic, Transformative and Excellence-Driven programs, the nonprofit is encouraging students to exceed expectations, defy stereotypes, and create an unyielding mindset. Learn more about how STS Enterprise is “Making Excellence The Norm” and DONATE TODAY at www.stsenterprise.org. 3 years ago, STS Enterprise started an initiative that would give the students of the STS Strive program a jumpstart on choosing their future career. “A Day in The Life” was created to allow students to gain hands-on experience in their desired professions, give them the opportunity to see if the field they selected was, in fact, a match while exposing students to connections with leaders within their field. It also displays company options for students to possibly work for after graduating, helping to retain Memphis talent. Every summer 8 students are chosen for an opportunity to job shadow with companies such as SweetBio, Driven by Music, UTC Carrier, Allworld Project Management, and Cushman and Wakefield. The selection is based off what the students have identified as their desired career choice from information collected at the beginning of the year. Imagine being in high school and being able to add working for a commercial real estate agency as experience on your resume. Companies are always looking for candidates who have years of experience before they can even step into their field, so this gives Memphis youth an advantage over other candidates.
" SweetBio has taught me to save lives using periodontal honey experiments. I verified expiration dates for quality purposes and insured the flexibility and durability of the product. I learned their products help remove toxins from the human body which equals a healthy life. It was truly an eye-opening experience." Says Amyria Garrett, a student in the program. STS Enterprise and their company partners have committed to giving a much-needed opportunity to Memphis youth as well as shown their commitment to making a difference in the city of Memphis. The coaches have dedicated themselves to make sure that the youth within the program have the resources and the tools they need to defy stereotypes, exceed expectations, succeed, and create a mindset that is unyielding. “Thank you all for the opportunity to host a student. Kayla and I really enjoyed our time with Amyria. She was very impressive, and Kayla and I were shocked that she was so young with an amazing head on her shoulders! 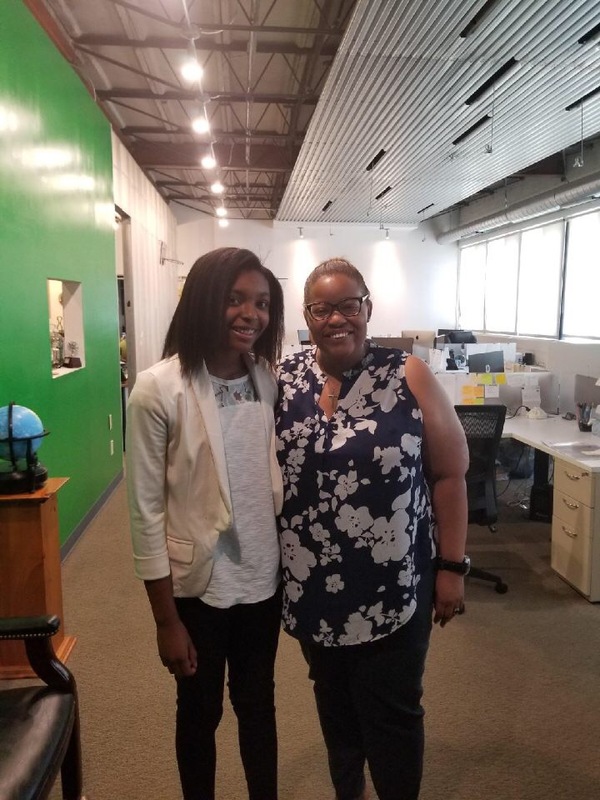 During her shadowing experience, she was able to perform some scientific studies, learn more about starting up a company, and asked very thoughtful questions about college and beyond. We were excited that we could show her a little piece of what we do. At the end of the day, Amyria said that we could “keep her”. Students like this are what any company is looking for so we’d love to keep in touch with her throughout the years and maybe even see what opportunities we can collaborate on in the future.” explains co-founder of SweetBio, Isaac Rodriguez. Continue to follow STS Strive and support their efforts. You may become a “Partner in Excellence” by donating $10/month, sign a student up for the program, or maybe even become part of the team! Click on the programs tab on our webpage to learn more about STS Strive. Many things change between high school and college, but one remains the same: Upperclassmen Privilege. Privileges range from first dibs on class registration to priority at networking events. Methembe Moyo, a rising sophomore at LeMoyne-Owen College and Zimbabwe native, was fine acquiescing to seniority — at least he was until he learned differently. In the fall of 2016, Moyo met Alton Cryer, co-founder of STS Enterprise, at a New Memphis networking event. STS Enterprise is a local nonprofit that focuses on developing and empowering high school and college students in the Mid-South. STS Elite is the nonprofit’s collegiate program that features meetings, socials, conferences, and workforce development opportunities. Moyo currently serves as the STS Elite Vice President and a member of the Meeting Coordination Committee. It is through a former STS Elite President that Moyo learned leadership has no age limit. Moyo did just that. By the end of his freshman year, he had received internship offers from two major Memphis corporations. He is currently the Quality Assurance Intern in AutoZone’s IT Department. Not to mention, he is on a full scholarship at LeMoyne, majoring in Computer Science with a concentration in Cyber Defense. He is an embodiment of the STS mission of Making Excellence The Norm. If you would like to interview Moyo and the leadership team of STS Enterprise, email stsentmarketing@gmail.com. In candid conversation, Jeremy Calhoun and Alton Cryer, co-founders of the nonprofit STS Enterprise, will explain they never sought to create a mentoring program. The two young professionals were not interested in hosting sports events for boys or etiquette classes for girls. Calhoun and Cryer wanted to give future generations of Memphians leadership tools to excel. Thus, the transition from STS Mentoring to STS Strive may have been inevitable. STS Strive is the new name of the nonprofit’s high school leadership program. The mission of STS Strive is to expose students, ages 14-18, to leadership development skills and post-secondary pathways. 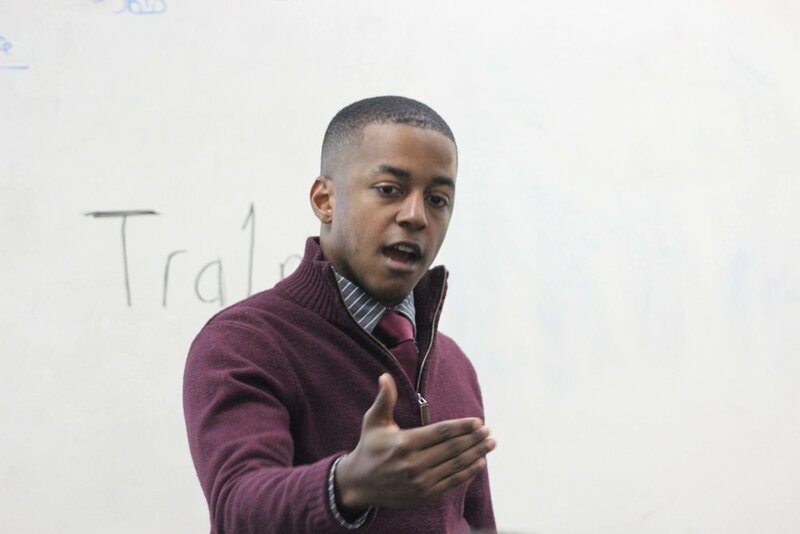 Founded in 2012, STS Enterprise’s two programs Strive and Elite, which serves college students, are dedicated to the motto of Making Excellence The Norm among minority youth in the city. Uniquely structured, the nonprofit’s board, executive team and mentors reflect its student population – young, diverse and driven. While the nonprofit’s high school leadership program has rebranded, the overall organization’s branding will remain the same. STS’ core colors are green, representing growth, and gold, representing high standards. Its logo, an arrow, symbolizes the upward trajectory that the nonprofit aims to establish for engaged youth. To interview STS Enterprise’s leadership team, email stsentmarketing@gmail.com. Every year The Memphis Flyer, a free weekly newspaper serving the Memphis community, publishes its list of Memphis’ top 20 best and brightest young people. This elite group of people contribute to changing the lives of those that they encounter as well as contributing to the growth of Memphis. This year’s issue, published on January 24th, featured four of STS Enterprise’s very own. Receiving this immense honor were Corbin Carpenter, Steven Sanders, J.B. Smiley, and Kirbi Tucker. These four individuals have dedicated their careers to serving others by working in areas involving at-risk youth, throwing their hat into the political ring, improving opportunities for education, and fighting poverty. They don’t just talk about the issues, they emerged themselves into them and find a solution. They are the true definition of what it means to create the change you want to see. Special Shout to them and their efforts, STS Enterprise is extremely proud to have these four incredible beings as members of their team. This accomplishment is well deserved and there will be much more to come. Corbin, Steven, J.B. and Kirbi please continue to be the light we need in the world and pave the way for others to follow in your footsteps! If you haven’t already, be sure to check out the latest issue of The Memphis Flyer’s Top 20 under 30! Also, please continue to follow STS Enterprise on all social media platforms, subscribe to the newsletter from the organization’s website, volunteer, or maybe even join the team! On December 21, 2017, Founders Jeremy Calhoun and Alton Cryer were panelist at the First General Body Meeting for The Memphis Urban League of Young Professionals. They were among some of Memphis' most elite leaders within education, real estate, Health, and community outreach. All panelist answered questions that involved how their professions affected the black community and discussed why they opted to enter into those fields. The meeting gave attendees the opportunity to have conversations that we as Memphis residents should be having with each other, like what were their thoughts on gentrification or what moving back to their old neighborhood could do to help redevelop the area. There were moments where the views discussed were on opposing sides however, even with opposing views the energy was high, and the passion could be felt from all in attendance.The meeting displayed the commitment to Memphis from its residents, the want for a change, and it was a reminder that we are stronger together. Hopefully the energy from that meeting carries over into the years to come and the passion turns into the growth. Memphis Urban League recently started the revitalization process of its chapter and with the direction of LaTricea Adams and her team, they are moving in the right direction. Memphis Urban League of Young Professionals is looking for leaders within the city to join and be a part of the movement, please check out their website by clicking on the link www.memphisulyp.org. Also, follow them on Instagram at Mem_ulyp and on Facebook by searching Memphis Urban League Young Professionals. STS Enterprise Corporation Vice President and Co-Founder Alton Cryer does an EXCLUSIVE Interview with Owls: The Startup Life. In this episode, we sit down with Alton Cryer of STS Enterprise as we discuss the first unofficial HQ of STS, why knowing the capacity of your team is important, and the plan for STS moving forward. Still in their twenties, these young men have already contributed more to the Memphis community than many folks twice their age. They founded Setting the Standard (STS) Enterprise, a nonprofit providing leadership and mentorship for teens and college students. On April 13, they’re hosting a networking event for college students to meet Memphis leaders. Learn more at stsenterprise.org.